Alligators are native to two regions, rivers, lakes and swamps in the southern United States and in ditches and ponds in eastern China - most of their natural habitat has been converted into paddy fields. These monstrous reptiles have an armoured body and use their muscular tails to propel themselves through water. Their 74 teeth can crush a turtle shell. Small animals are swallowed whole, larger prey are chomped into chunks. 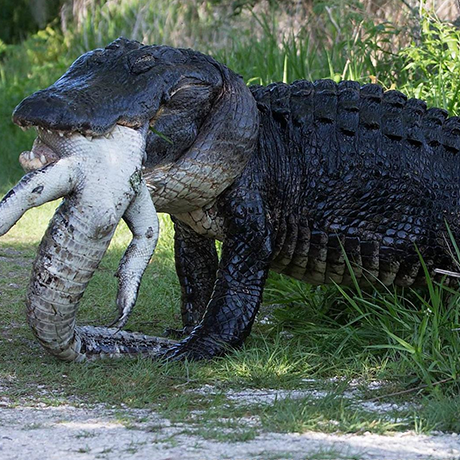 Alligators will eat fish, turtles, birds and mammals that approach the water's edge.